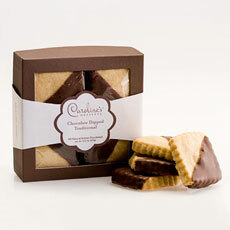 There’s something so cozy and familiar about dunking a shortbread cookie in hot tea or cocoa. We took that idea and added an elegant twist, pre-dunking our delicious buttery shortbread in premium European milk chocolate. The result? Gift-worthy cookies as pretty as they are delicious.